Maurer, who has been doing masonry work in Pennsylvania for close to 25 years, specialized in stone patios until rising prices for materials forced him to explore other avenues. 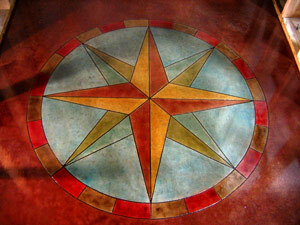 About 10 years ago, when he was in his 30s, he discovered the world of decorative concrete. “I fell in love with what you could do with it,” he says. 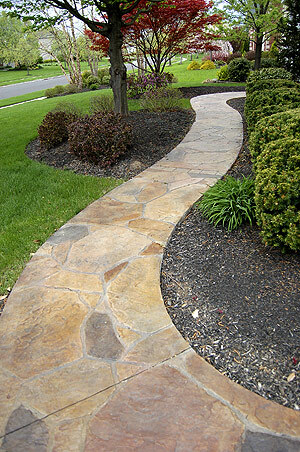 The work wasn’t nearly as labor intensive as using real stone, and the process was much more affordable for homeowners. At about that same time, he returned to school to pursue a degree in architecture at Philadelphia College of Textiles & Science, now known as Philadelphia University. It was there he met and fell in love with his now-partner and wife, Elizabeth. Also a returning student, she was studying interior design. “When I graduated, we decided Gerry would stop working for other contractors,” Elizabeth says. 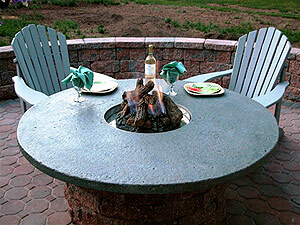 So in 1997, they founded GEM Enterprize, which subsequently morphed into Liquid Stone Concrete Designs in 2006. Besides husband and wife, there are three full-time employees, including Arron Schopfer, who also holds a degree in architecture from Philadelphia University. Schopfer met the couple at college and has been with them since the beginning. 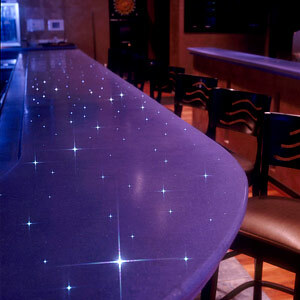 Recently, Gerry Maurer and his crew poured a countertop that was not so traditional — one laden with fiber optics for a local bar — which garnered a lot of attention. In fact, he was one of six people invited to talk at the Concrete Countertop Industry Conference held in Charlotte, N.C., last October, where he addressed how to sell and place fiber optics. Maurer notes that he often blends different colors of color hardener to match existing brick and stonework in these old structures. 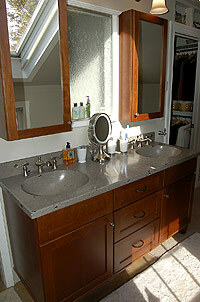 “I would never dream of painting a color on,” he says, adding that a lot of contractors in his area do just that. This coming year, he says, his company is going to explore more artistic applications of concrete with furniture and fixtures for both interior and exterior uses. But for now, Elizabeth and Gerry’s latest venture is a showroom that opened Oct. 1, 2007, in an old Victorian-style building in Peddler’s Village in Lahaska, Pa. There, browsers and potential clients can see samples of the company’s handiwork, from sinks and countertops to acid-stained floors and overlays. The location is perfect, Elizabeth says, as the village is one of the state’s busiest tourist destinations. For that, Elizabeth advises, go to school and learn all you can about concrete. “You need to understand the basic material to really work the medium,” she says. And take a class or two in design to give your work some “pizzazz and pop” instead of slapping down the same old squares and rectangles.